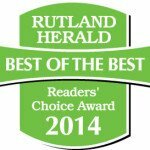 Killington & Rutland Divorce, DUI Lawyer | McCamley & Branchaud, P.C. McCamley & Branchaud, P.C. – Best of the Best in 2014! McCamley & Branchaud, P.C. is a full service law office located in Rutland, Vermont. The attorneys have decades of combined legal experience and represent clients in Rutland and Southern Vermont. The office is located in Downtown Rutland on Wales Street above Table 24. The office is one block from Rutland County’s Civil Court, and two blocks from the Family and Criminal Courthouse. From complex divorce and child custody cases, to jury trials in criminal and superior court, the office spends a lot of its time in the Courtroom. The Litigation section of the practice is headed by Matthew S. Branchaud, a Rutland native, who has been practicing before the local courts for years. Matt has argued cases before juries across Southern Vermont for serious felonies and other crimes. He has represented clients in trials before the Criminal Court, Family Court, Civil Court, and the Environmental Court. Matt also represents individuals hurt in car crashes, landlords in eviction proceedings, and small corporations with everything from initial set, collecting past due accounts and defending lawsuits. Call Matt Branchaud anytime at (802) 775-1177. The firm also has one of Rutland’s largest real estate practices helping buyers and sellers of Vermont homes and land. John E. (Jack) McCamley has been a real estate attorney for almost 30 years, and often handles up to eight or more closings a week. He is trusted by local banks and financial institutions to oversee the mortgage and closing process. His experience and attention to detail makes buying a home effortless. Considering the volume of transactions, our legal fees are among the lowest around, which means more money in your pocket when you leave the closing table. Call the office for a consultation today at (802) 775-0064.